Would jelly by any other name still taste as sweet? Yes. Yes it would. So jelly, conserve, or jam are all freaking delicious and they are insanely easy to make. Seriously, boil some fruit with sugar and pectin and you have jam. So freaking easy! I was intimidated for far too long by this simple art. 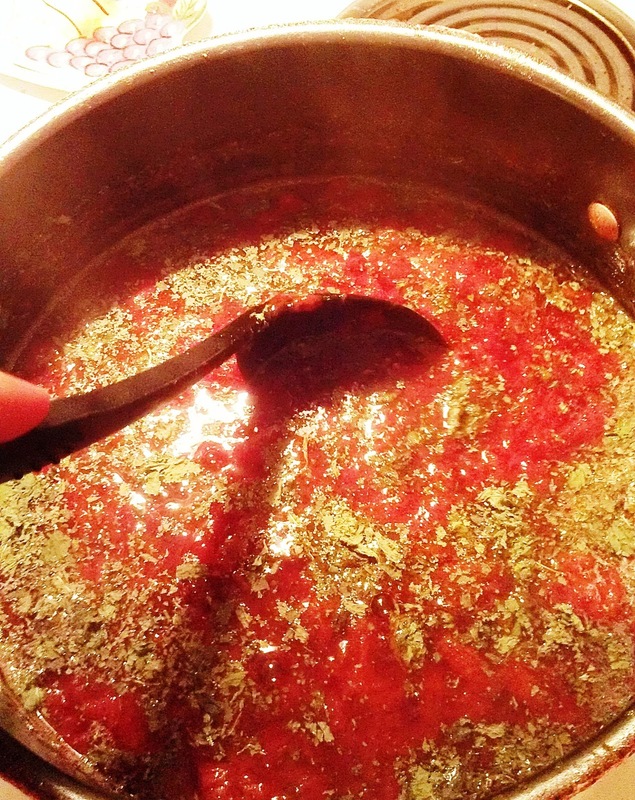 I have made this recipe a few times, and I like it to be more of a jam consistancy. I have included instructions if you prefer either conserve or jelly. 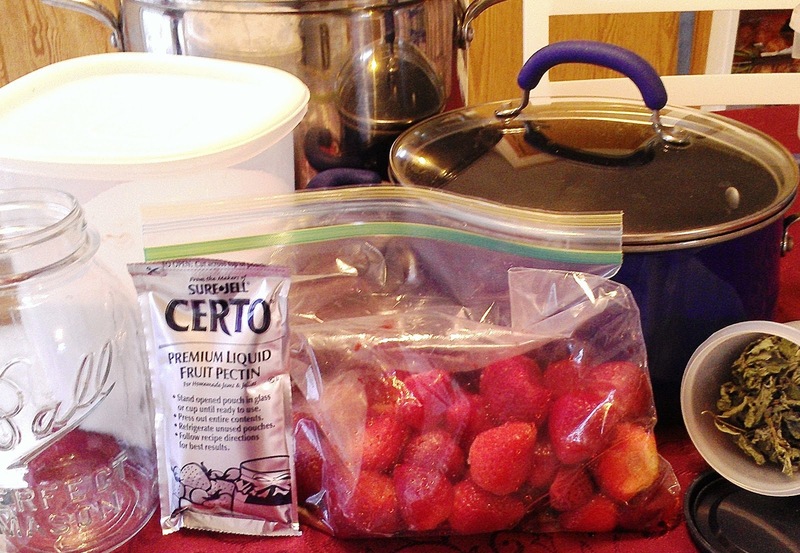 This recipe has a delightfully sweet strawberry flavor with just a hint of mint in the finish. It is great on fresh bread, like what I made here, topping pancakes, or spooned over french vanilla ice cream. It is also a terrific way to use up mint if you happen to have an overabundance of it in your garden like I do. I normally buy strawberries when I see them on sale and clean and freeze them to make this when I have the chance! From these humble beginnings, awesome ensues. 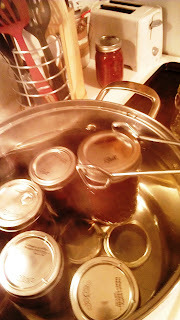 To actually can your jam you are going to need: one boiling water canner (big pot with some sort of raised bottom, I use canning rings held together with twisty ties), soup pot, spoon, jars, lids, and canning rings. 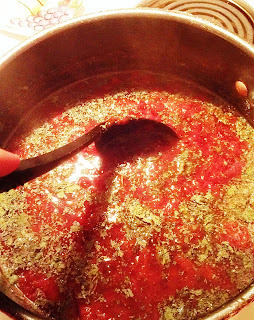 You could feasibly skip the canning step and use this like freezer jam, but I am not sure how long it will keep. Sterilize your jars and lids. Wait for the jam. Mix the berries and sugar in your soup pot and let it set several hours or overnight at room temperature. Set that baby on the stove and add your mint and lemon juice. Bring it up to a rolling boil for about ten minutes. Boil, boil, boil the stuff. Until you want to scream. Merrily, merrily, merrily. Until it is done you deem. 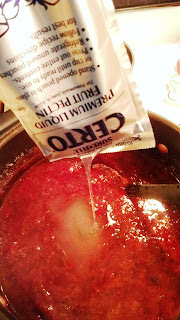 At this point add your pectin if you're using it and return the pot to heat for one to two minutes. It will set up very quickly, so be sure to watch it for a distinct change to a very glossy, non juicy, gel-like finish. I use a measuring cup to pour the molten hot jam into the sterilized jars, but you can use a ladle and funnel if you prefer. Leave a one inch gap at the top of the jar. Cover with sterilized lids. 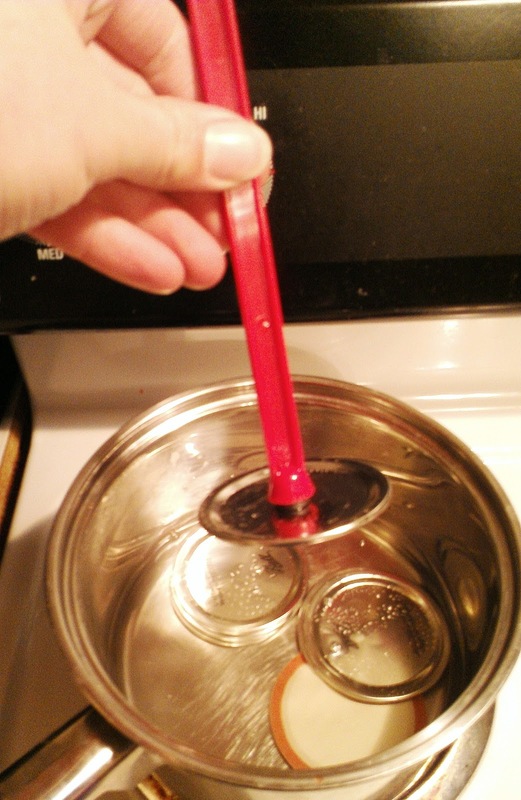 You can use tongs, but for about ten dollars they sell canning sets with nifty tools like these! Then finger tighten the canning rings. Careful! It will be hot! 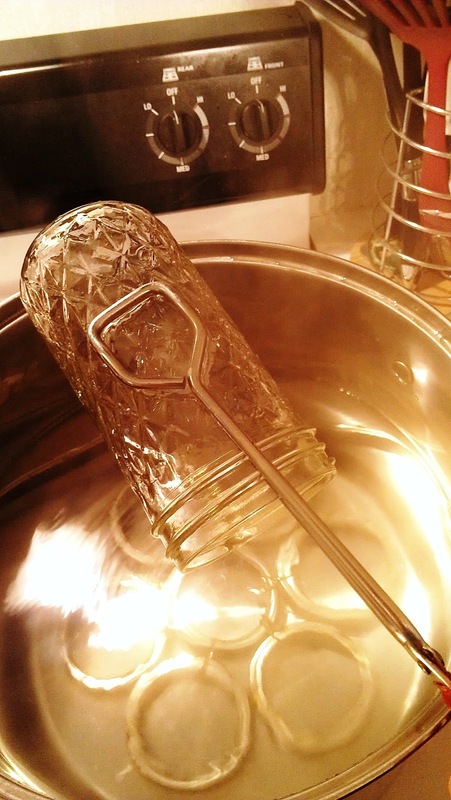 Process the jars for ten minutes under boiling water. Remove and cool. Make sure that your lids are depressed. 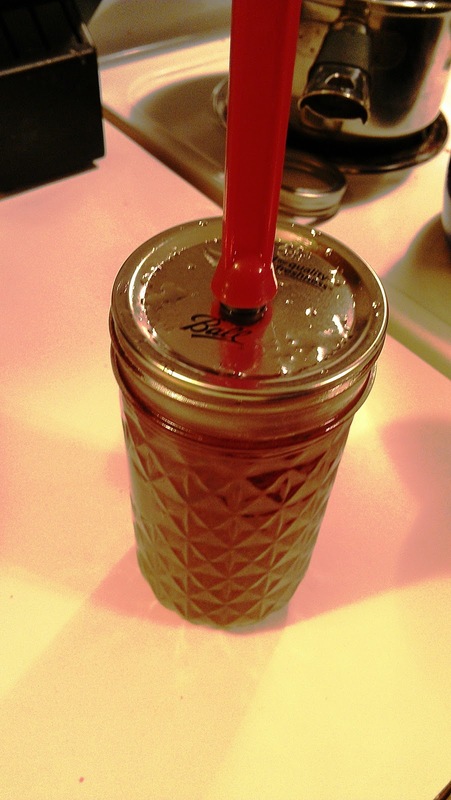 If they aren't return the jars to the boiling water and process again, or store them in the fridge and use quickly. This jam will keep for about nine months unopened in a dark place. Like all jam, make sure to shove it in the fridge after you've opened it. Well, that is if you don't eat the entire jar with a spoon. Which I may or may not have done. No witnesses!